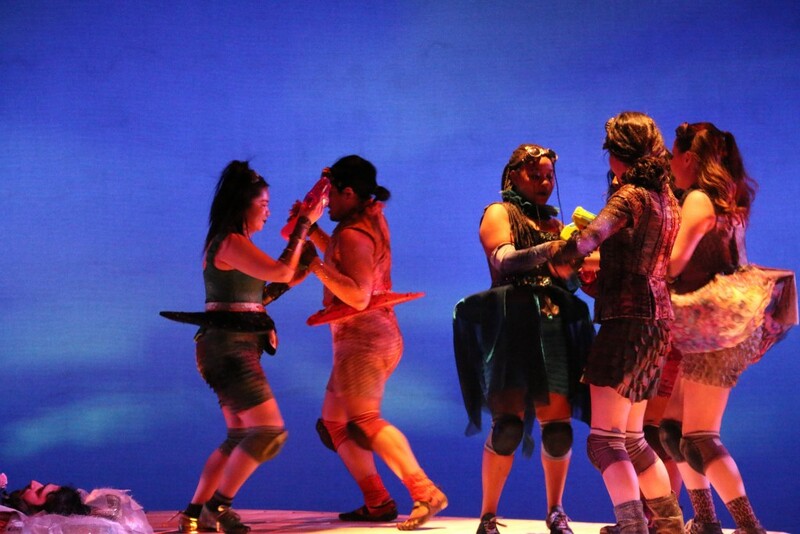 The cast and crew of “A Midsummer Night’s Dream” will present their last round of performances on Thursday, Friday and Saturday in the Sharp Theater of the Berrie Center. The production commemorates the 20th anniversary of the arts building on Ramapo’s campus since it was the first production to debut in the newly opened Berrie Center in 1999. Ramapo theater faculty member Terra Vandergaw directed the 1999 production in addition to the current production. Contrasting the production’s contemporary time period, the immaculate rounded stage that stretches out into the audience is a homage to the Globe Theatre in London where many of William Shakespeare’s plays were performed in a similarly open setting. “A Midsummer Night’s Dream” revolves around three main groups: the court, the mechanicals and the fairies. Set in Athens, the play begins when Hermia’s father, Egeus, is enraged because his daughter refuses to marry Demetrius, instead choosing to pursue a relationship with Lysander. From there, the story sprawls and transitions from Athens to the fairies’ enchanting magical world. “Although it’s one of Shakespeare’s most comedic plays, it’s also on the darker side because of the fairy factor and there are a lot of things that happen that are dark in tone,” said Akdeniz Rysmendieva, who plays Titania, the fairy queen, and Hippolyta, the duchess of Athens. “It’s basically these three groups that we’re following through and how their stories are interwoven and how brilliantly Shakespeare can do that,” Vandergaw said. While revisiting the script during this production, Vandergaw said she interpreted certain passages and characters differently from when she directed it 20 years prior. Toxic masculinity and climate change are pertinent issues that stood out to her when exploring the text this time around. “This version is very different, and yet I’m very influenced by what we did 20 years ago,” Vandergaw said. “It’s really different coming to it in 2019 because our sensibilities are very different now. She added that showcasing diversity was an integral part of this play by having students of different ethnicities speak in their native accents. The current production possesses a few additional features that the one in 1999 did not, including its immense set design and a focus on contemporary music. The production offers the audience an immersive experience, as actors move around them carrying scenes throughout the aisles. “Also it being a 20th anniversary celebration, I wanted it to feel like we were inviting the audience, that we were all together in this for the big celebration,” Vandergaw said. The production also has a heavier focus on music which establishes its contemporary time period. The production’s original music was composed by senior Brady Bock, who leads the pit’s quartet of electric guitar, bass, keyboard and drum set. Though he has released original music through Ramapo’s music label, Ramix Recordings, and written music for other classes, this was his first time composing original music for a theater production. Bock said the experience has been creative and collaborative from early rehearsal days even up until opening night. “Essentially the process with the band, a lot of it was ‘here’s music that I have, what can we do to make it come alive,’ so it was very much collaborative in that aspect and collaborative just in timing it out with what’s happening on stage. It was a very unique process,” he said.